Croker, R., & Ashurova, U. (2012). Scaffolding students’ initial self-access language centre experiences. Studies in Self-Access Learning Journal, 3(3), 237-253. As the number of self-access language centres (SALCs) in Japanese universities continues to grow, so too does the challenge of successfully introducing them to first-year university students, whose initial experiences of self-access language learning may otherwise be confusing and even unsettling. One approach is to carefully scaffold students’ first SALC encounters by connecting them with their classroom learning experiences. This paper discusses one such approach developed at a private university in central Japan, which was based upon a two-stage ‘push-pull’ ‘materials-light, people-focused’ strategy. Teachers initially ‘pushed’ their students to visit the SALC by giving them speaking ‘homework’ to be done there. The SALC then also offered interesting interactive events designed to ‘pull’ learners to continue to come. These push-pull activities could be done with few or no materials, and emphasized interaction with people rather than materials. This two-stage, push-pull strategy served as a bridge between the language classroom and a SALC, helping learners make the first steps in their transition from being a ‘classroom English learner’ to becoming a ‘SALC English user’. For many first-year Japanese university students, attending a self-access learning centre (SALC) can be daunting. From their experience, English has often been a language that has been taught inside the classroom under the direct supervision and control of the teacher. The freedom of a SALC may easily bewilder these students. That freedom challenges their assumptions about learning by asking them to accept that a language is primarily learned and not taught, that this learning can occur outside the classroom and beyond the teacher’s gaze, and that it can be a collaborative, self-directed endeavour. Given this gulf between their previous learning experiences and the ‘foreign culture’ of a SALC (Jones, 1995), it is perhaps not surprising that many first-year students are apprehensive about beginning to engage in self-access learning. To help first-year students overcome this initial hesitance to step foot in a SALC, a two-stage, push-pull strategy was developed by the English program on the Seto Campus of Nanzan University, Japan, for its SALC, called the World Plaza, when it initially opened in 2006. Starting in the first weeks of the spring semester, first-year English communication and reading teachers ‘pushed’ their students to go to the World Plaza by giving them interactive speaking projects and tasks to do there, instead of, or in addition to, regular class homework. Then, from the middle of the first semester, events were also held in the World Plaza to ‘pull’ students there, such as having regular chat time, lunchtime discussion clubs, movie clubs, a language clinic, and guest speakers. This two-stage, push-pull strategy was successful in helping many first-year students develop the habit of regularly coming to the centre. This strategy also dovetailed with two crucial features of the World Plaza: a ‘materials-light, people-focused’ approach which emphasized students interacting with each other rather than with materials; and a ‘no using Japanese’ speaking rule. These features put interacting in English at the very heart of the World Plaza, a noisy, bustling space about the size of a high-school classroom. It was assumed that the students were the primary, and sufficient, learning resource. By doing so, students could change the way they see themselves, from being ‘classroom English learners’ to becoming ‘SALC English users’ – students who enjoyed coming to the SALC to use English and to participate in the English language learning community that developed there. There is now a growing body of research that supports explicitly linking the classroom with a SALC. The research David Gardner and Lindsey Miller conducted at universities in Hong Kong in the mid-1990s (as reported in Gardner & Miller, 2010) found that there were weak links between classroom instruction and SALCs, as the self-access programs had been developed independently from classroom teaching. However, when they repeated their study in Hong Kong in 2010, they found that there was much more integration. One way that classrooms were being integrated with SALCs there was through project-based learning, a strategy that Gardner and Miller had first advocated over a decade earlier: “Although a project may be started in class, learners could use self-access facilities and libraries to continue their work; …. In this way classroom-based learning can be linked with a self-access centre” (Gardner & Miller, 1999, p. 167). 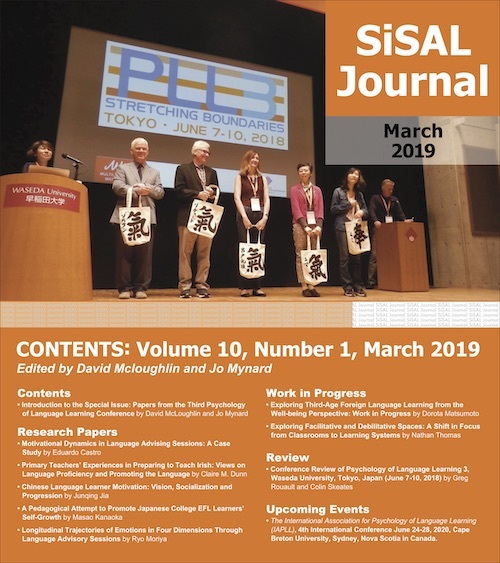 There are also some published reports of a shift to a closer integration of classroom activities with a SALC through projects and tasks in the Japanese university context. One example is Gene Thompson and Lee Atkinson’s account of project-based learning at a private university in Hiroshima (Thompson & Atkinson, 2010). There, classroom learning was connected to materials and resources in the university SALC through activities and projects. These were skillfully designed to serve as an ongoing orientation for first-year students to the SALC and its resources. Each activity the learners did there used different resources or areas of the SALC, designed around specific ‘pathways’ to introduce learners to the centre. Thompson and Atkinson found that “[p]roviding specific pathways into the SALC gave even the most reluctant learners a clear reason and objective for using the center” (Thompson & Atkinson, 2010, p. 53). Similarly, Hamish Gillies (2010) suggested scaffolding such reluctant learners’ initial jump from the classroom to the SALC with short and achievable tasks that the teacher sets and practices in the classroom before learners complete them in the SALC. For Gillies, the goal is to introduce learners to the SALC through interactive and collaborative activities so that their first experiences there are enjoyable and successful. In the case of Nanzan University, in preparation for the opening in 2006 of the World Plaza on the Seto Campus, the twelve teachers in the English program, which included Robert (one of the authors of this paper), began discussing its concept and operation. We decided that the World Plaza itself would be staffed by one full-time and two part-time ‘World Plaza Assistants’, would be open from 10am to 6pm weekdays, and funded initially by a four-year Japanese government ‘Gendai GP’ grant. We also decided that the World Plaza would have relatively few language learning materials – only some newspapers, magazines, DVDs of movies and sitcoms, and two flat-screen TVs – but many tables, chairs and sofas where learners could sit and interact with each other. Benson had reminded us that “organizational aspects of the center and its resources convey messages to learners about the nature of language learning” (2001, p. 119), and that open areas for interaction emphasize that language learning is a process of communication and collaboration (Benson, 1995). Language learning histories – done with a senior student: To prepare for the WPAC, learners first interviewed two or three classmates during class time about their language learning experiences, using both questions given by their teacher and also their own. After class, in the World Plaza, each learner then interviewed one senior student to create a language learning history of that person, which the learner condensed into a bullet point form. In the following class, learners summarized this language learning history to a partner. Partners compared their own and their senior’s language learning histories. This project gave the first-year students the opportunity to meet learners in the upper years, many of whom were quite motivated to study English. Travel preferences survey – done with first-year students from other classes: Using questions that students themselves had created in class, learners interviewed four or five students from other classes who were in the World Plaza about their travel preferences (Would you prefer to stay in a hotel or a ryokan? Travel by bus or train? Schedule lots of activities or have lots of free time? ), and reported the results back to a partner in the next class. The two partners compared their results, then the class jigsawed so each partner could summarize these differences to a new partner. Such projects socialized the whole first-year to work together in the World Plaza. Describing pictures – done with one student from the same class: Learners practiced describing pictures in class, using language practice sheets. In the World Plaza, learners selected three pictures from the magazines on display there, took a photo of them with their phone, and practiced describing them for a ‘mini-presentation’ to a different partner in the next class. In class, this partner then chose one picture to describe back to the presenter, who listened and helped if necessary. This project prepared students for their mid-term speaking test, and it helped learners become used to the idea of practicing English outside class for assignments and tests. WPACs were different from regular language class homework. Regular homework was assigned to be done individually but the key feature of WPACs was that they were done interactively with other students, and often with students from other classes. Another distinction was that regular homework often required learners to read and write to prepare them for more interactive communicative tasks in class whereas WPACs obliged learners to also speak and listen – the interactive communicative tasks were ‘the homework’. Getting learners to speak and listen was consistent with the interactive nature of the World Plaza, and to focus on language as a tool for communication rather than exam preparation. It also helped to develop a language learning community that, as previous research indicates, motivates learners to continue to use a SALC (Hughes, Krug and Vye, 2011), as discussed further below. To keep students accountable for their work in the World Plaza, all WPACs had to receive an authorized stamp or signature in order for students to get credit. Moreover, due to their interactive nature, cheating on WPACs or doing the tasks in Japanese was made quite difficult. One shortcoming of WPACs was that they had to be done in the World Plaza, and only during opening times, while regular homework could be done almost anywhere and at any time. However, students could and did negotiate to do WPACs outside the World Plaza if they had a pressing reason, such as being unable to go to the World Plaza that week, or preferring to do the WPAC with a family member or particular friend. This extended the learning space beyond the World Plaza to the broader world – which in fact was the real goal of the WPACs. 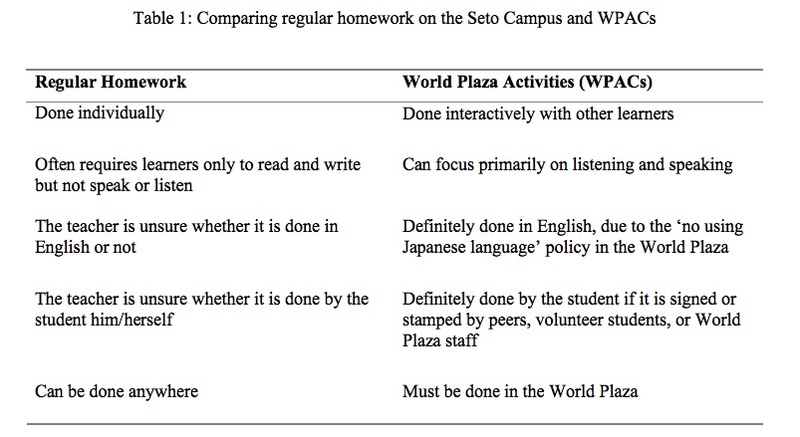 Table 1 summarizes the differences between regular homework and WPACs. In order to ensure that learners had enjoyable and successful initial self-access learning experiences, they had to understand clearly how to do each WPAC. As learners were unfamiliar with them at the beginning of the semester, every WPAC was carefully designed to be fun and achievable, and each one was introduced carefully in class. WPACs were based upon the topics, tasks, and activities done in class, using language that learners had already prepared there. To create an expectation that learners would be able to succeed, each WPAC was first modelled and practiced in class, giving learners opportunities to make those inevitable first mistakes and ask questions about how to avoid them. It also gave teachers a chance to identify and address any potential unforeseen problems. Additionally, to promote positive interactions among students, appropriate attitudes in the World Plaza were also discussed. For example, teachers and students discussed being positive about speaking English, being open to helping other learners do their WPACs, and being challenged by World Plaza experiences. Learners seemed to carry those attitudes into the centre, where they facilitated learner interaction and helped make the experience enjoyable and successful. Interacting in the World Plaza became an opportunity for learners to extend their language comfort zones. In our English program, each teacher could determine how to link WPACs to their own classroom. Some teachers regularly gave WPACs every week, and for some courses 10% of class grades were based upon them. Also, some teachers required all learners in a class to do certain WPACs, but made other WPACs optional. However, of these optional WPACs, learners may have been required to do a certain number (say, two or three) over a semester. Since learners were busy with club activities, part-time jobs, and homework from other classes, they were given at least a week to complete a WPAC. To prove that they had done their WPAC appropriately, when learners had completed one they got the signature of their WPAC partners and of the World Plaza staff on their WPAC sheet. Also, there was a World Plaza attendance stamp card system called the World Plaza Passport. Learners received one stamp for each 30 minutes they were in the World Plaza. For attending a regular event, learners received a blue stamp and for completing a WPAC, learners received a red stamp. The World Plaza Assistants would also note the date the WPACs were done. When learners had finished their first ‘bronze’ level stamp card, they would move up to the silver, gold, and then member levels, which motivated many learners to keep coming back to the World Plaza. Who could learners do their WPACs with? At the beginning of the semester, teachers allocated WPAC partners in class before going to the World Plaza to help ease learners’ initial trepidations. However, we soon found that it was better to allow learners to select their own partners, either before going to the World Plaza or once they were there. The World Plaza Assistants, one of whom was Umida (the other author of this paper, and the full-time World Plaza Assistant during this project who developed many of the pull activities), could also help learners find a partner if necessary. It was easiest for learners to do WPACs with learners from the same class. Classmates knew the context and purpose of the WPAC, and had practiced the necessary language. However, learners were often required to do their WPACs with learners from other classes, or encouraged to invite friends from other classes to go to the World Plaza to do them together. Doing WPACs with learners from other classes proved to be more challenging and exciting, and helped build the sense of there being a World Plaza community that spanned the entire school. Moreover, in ‘managing’ such WPAC interactions with students from different classes, learners needed to explain the ‘what,’ ‘why,’ and ‘how’ of the WPAC, and also help the other learner with the language needed to complete the task. In so doing, learners had to use a broader array of language resources than they would with a classmate and there was much more opportunity for unexpected responses and language. For example, for the travel preferences survey, the learner had to explain to the student from the other class what the survey was, why it would be interesting to do, and describe how to complete it; also, the students from the other classes might use language that the learner had not practiced in her own class. However, we found that it was better to wait until learners had become familiar with the idea of doing WPACs before expecting them to work with students from other classes, and to keep these WPACs simple and straightforward. One way we thought about push activities was in terms of how teacher-directed or learner-directed they were. For example, when a WPAC was an interview, if the teacher decided the topic and all of the questions and the learners only chose their partners, then this WPAC was relatively teacher-directed. On the other hand, if the learners could decide the topic and write their own interview questions, then this WPAC was more learner-directed. The distinction is important because making WPACs more learner-directed over the semester and year led learners to take more control over their own learning and develop greater autonomy. Another way we thought about WPACs was in terms of how many World Plaza materials it required. For example, an interview required no World Plaza resources, as learners would bring questions on their own paper and just chat to other learners there. Such an activity was ‘materials light’. However, if the WPAC needed the learners to watch a DVD, read a newspaper or magazine, or play English language board games, then it required more materials. This distinction is important because the availability of materials could be a major constraint on projects and tasks, particularly when a SALC newly opens or has a limited budget, an issue that Thompson and Atkinson (2010) also discovered. The framework in Figure 1 categorises WPACs along two continuums. The horizontal continuum represents the degree to which WPACs were teacher- or learner-directed. WPACs on the left were more teacher-directed, whereas WPACs on the right were more learner-directed. The vertical continuum represents the amount of material required. WPACs at the top of Figure 1 required few or no materials, whereas WPACs at the bottom required more materials and these materials were either permanently kept in the World Plaza or put there for just a short period of time. 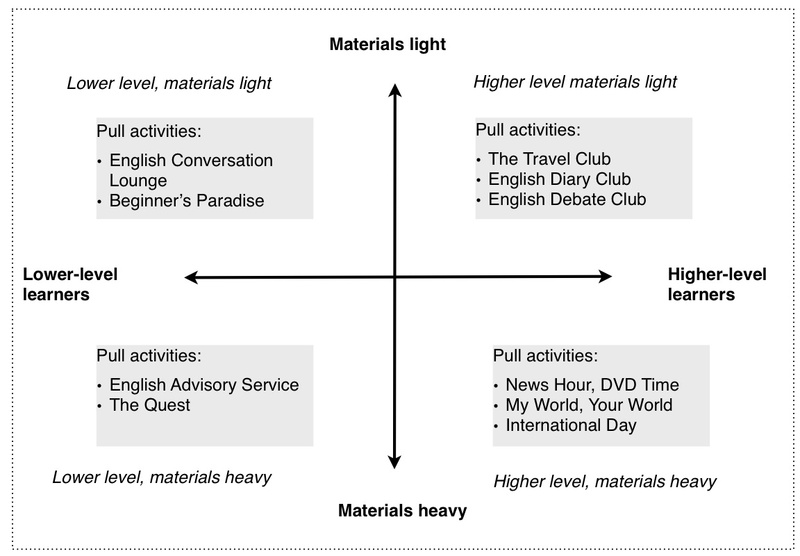 In the top-left quadrant, then, are activities that are teacher directed and materials light, whereas in the top-right quadrant are activities that are learner directed but still materials light. 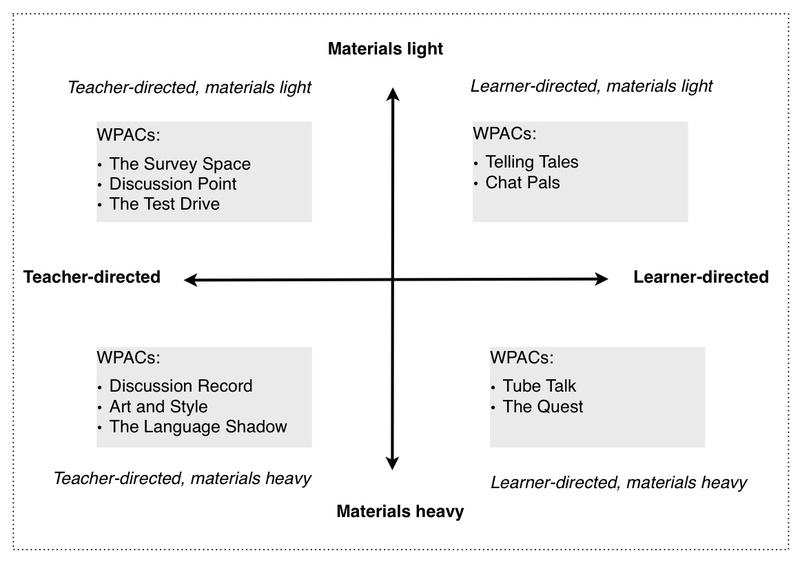 In the bottom-left quadrant are activities that are teacher directed but more materials heavy, while in the bottom-right quadrant are activities that are learner directed but more materials heavy. All of the example WPACs are explained in more detail in Appendix A. The WPAC projects helped first-year learners develop the habit of going to the World Plaza regularly but they were just the first stage in scaffolding learners towards using the World Plaza regularly. The second stage was holding events in the World Plaza that pulled learners to keep visiting there of their own volition. This two-stage, push-pull process is represented in Figure 2. Figure 2: Developing greater learner-directedness: push projects and pull events Note: Adapted from Jones (1998). English Conversation Lounge: Learners dropped by to chat with the Assistants and other learners about light topics. Serving as the core of World Plaza community-building, this event created opportunities each day for learners to talk to each other without worrying about their proficiency. A special event called ‘Beginners’ Paradise’ was arranged for elementary-level learners. Travel Club: Learners could share their travel experiences and information about previous and prospective destinations for leisure travel, study-abroad programs, and home stays. Enthusiastic senior students eager to share their travel experiences, and junior students thinking about, or dreaming about, their next trips, usually participated. Learners were encouraged to bring photos and other mementoes. Motivating learners to continue to use English outside the classroom, beyond homework and structured activities like WPACs, is arguably one of the biggest challenges facing any EFL language program. Successful learning in itself can be very motivating, and learners who regularly attend a SALC have been reported to improve their English proficiencies more than double those of learners who do not attend (Vye, Krug, Wurzinger, and Hughes, 2011, and Krug, Wurzinger, Hughes, and Vye, 2011, both cited in Hughes, Krug and Vye, 2011). But these successes may take time to become apparent. What is the key to helping learners reach that point? Leander Hughes and his colleagues Nathan Krug and Stacey Vye (2012) found that the reasons learners at a public Japanese university went to their SALC changed over time. Initially, learners went because they felt that it would help them to learn English; however, the most common reason for continuing to visit was primarily social; that is, they felt that they had become members of a learning community there. Also, the teacher pushing learners to go to the SALC became a less important reason over time, and the presence of resources there was not particularly significant at any point (Hughes, Krug and Vye, 2012). The authors concluded that the key to fostering long-term motivation to attend a SALC lies in nurturing the establishment of social bonds between learners. These findings are consistent with the push-pull approach we had adopted. In the first stage, the teachers designed WPACs that got learners to see the World Plaza as a learning space outside the classroom. In this learning space, learners could interact with learners from other classes and years, and this began to socialize learners into the World Plaza language learning community. In the second stage, the role of the teacher becomes less important, and the World Plaza Assistants facilitated the development of a learning community by organizing many events each week that were interesting, appealing, and most importantly, interactive – reflecting the greater emphasis placed on socializing and community-building. Moreover, the materials-light nature of the World Plaza was not important to most learners, who did not see resources as a major reason to visit the World Plaza. We thought about pull events in a similar way to the push activities; in terms of how many materials they required. However, rather than thinking of pull events in terms of being teacher-directed or learner-directed, we conceptualized them in terms of which level of learner they were best suited for, i.e. lower-level learners or higher-level learners. Figure 3 illustrates this framework, and provides examples of each type of pull event, which are all explained in more detail in Appendix B. Lower-level learners would often initially choose to attend easy and fun social events and later try more challenging events. Higher-level learners would often go directly to the more difficult events, and some even gave presentations as lunchtime guest speakers. Less confident learners’ journeys would often follow a similar route; first, they might participate in lower-level interactive events and later try higher-level ones. The more adventurous learners might later become lunchtime guest speakers. In so doing, the student guest speakers acted as guides or near-peer role models (Murphey, 1996) for other learners. Thompson and Atkinson (2010) remind us that it is important not to dichotomize learning experiences into the classroom versus a SALC, but rather to think in terms of the degree to which they can be integrated – from weak integration to strong integration. For the Seto Campus English program teachers, the push-pull strategy offered an approach that increased that integration in a way that made sense to our learners. It scaffolded their journey from more structured teacher-directed activities begun in their classrooms through to more learner-directed projects that occurred in a SALC. The journey our students undertook at the World Plaza was a people-focused process that did not require many resources or even staff – just learners, a space, and a strategy to skillfully link the two together. It was a strategy that recognized that learners have different motivational triggers, and sought to provide multiple opportunities for them to explore new learning experiences and learner identities as they developed from being a ‘classroom English learner’ toward being a ‘SALC English user’, actively contributing to the development of the language learning community there. Robert Croker is from Australia, and he continues to teach in the English program on the Seto Campus of Nanzan University, where his students are still going to the World Plaza. His research interests include qualitative research and action research methods. Umida Ashurova is originally from Uzbekistan and currently teaches English at Sugiyama Jogakuen University, Japan. She began her career in EFL in Japan at the World Plaza, and was the first World Plaza Assistant. Her research interests include integration of self-access into curriculum and practice of English as a lingua franca. We would like to acknowledge that the ideas in this paper are not just our own, but belong to all of the Nanzan University Seto campus English program teachers, particularly Yoshikazu C. Watanabe, who originally conceived the World Plaza concept, and David Barker, the first World Plaza coordinator. We would also like to acknowledge Monkasho Gendai GP funding for this project. Benson, P. (1995). Self-access and collaborative learning. Independence 12, 6-11. Gardner, D., & Miller, L. (2010). Beliefs about self-access learning: Reflections on 15 years of change. Studies in Self-Access Learning Journal, 1(3),161-172. Gillies, H. (2010). Listening to the learner: A qualitative investigation of motivation for embracing or avoiding the use of self-access centres. Studies in Self-Access Learning Journal, 1(3), 189-211. Hughes, L. S., Krug, N. P., & Vye, S. L. (2011). The growth of an out-of-class learning community through autonomous socialization at a self-access center. Studies in Self-Access Learning Journal, 2(4), 281-291. Hughes, L. S., Krug, N. P., & Vye, S. L. (2012). Advising practices: A survey of self-access motivations and preferences. Studies in Self-Access Learning Journal, 3(2), 163-181. Jones, F. R. (1998). Self-instruction and success: A learner profile study. Applied Linguistics, 19(3), 378-406. Jones, J. (1995). Self-access and culture: Retreating from autonomy. ELT Journal, 49(3), 228-234. Murphey, T. (l996). Near peer role models. Teachers Talking To Teachers: JALT Teacher Education SIG Newsletter, 4(3), 21-22. Thompson, G., & Atkinson, L. (2010). Integrating self-access into the curriculum: Our experience. Studies in Self-Access Learning Journal, 1(1), 47-58.